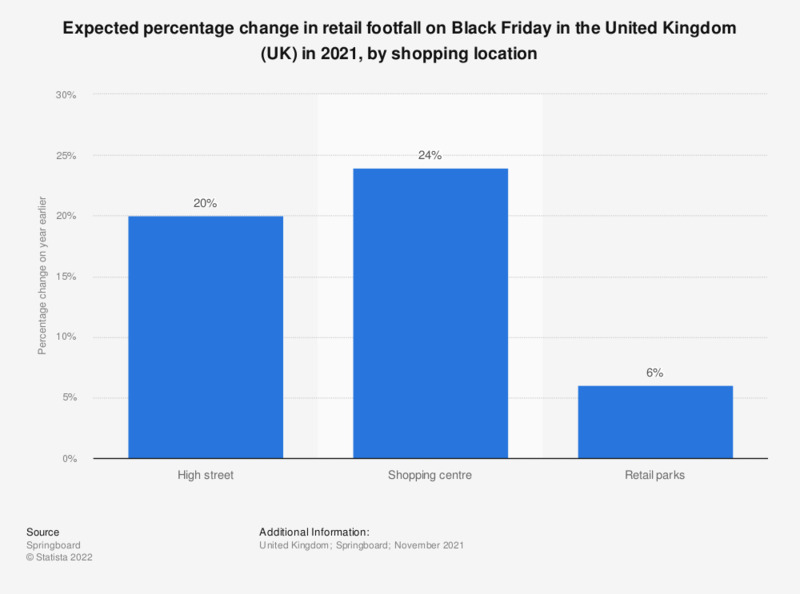 This statistic presents the percentage change in shopper numbers ('footfall') in the United Kingdom on Black Friday 2016 (November 25), split by high street, shopping centre and out of town retail locations. Black Friday originates in the United States, as the shopping day after Thanksgiving, when retailers offer large discounts, marking the start to the Christmas shopping period. In the UK footfall on Black Friday rose by approximately 2 percent in 2016. The high street saw the biggest increase, growing by 2.8 percent on the previous year. Figures show the year-on-year change in Springboard's national retail footfall index. The index measures the number of visitors to high street, shopping centre and retail park environments across the UK. How much importance do you attach to design in shops on the high street? What is your main use for the high street store? Do you agree or disagree with the following statement: "I prefer to do my shopping in a large shopping centre than on my local high street"? Which, if any, of the following would make you more likely to visit your local high street more? Do you agree or disagree with the following statement: "My local high street is an important part of the community"?